Likewise! I’d like to see some of our local stations / convenience stores have proper racks much less something like this. 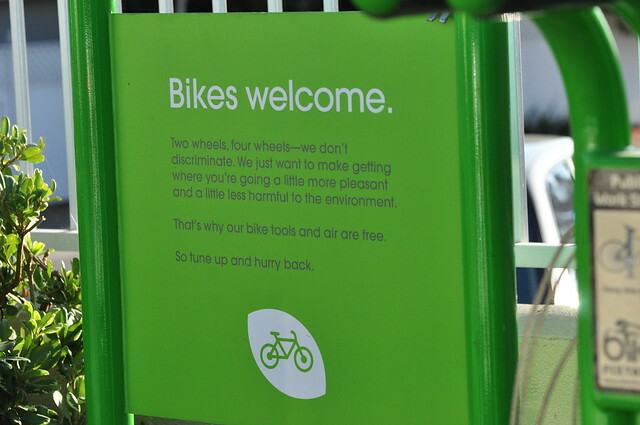 It’s odd to see a gas station cater to cyclists, but I am happy to see it. 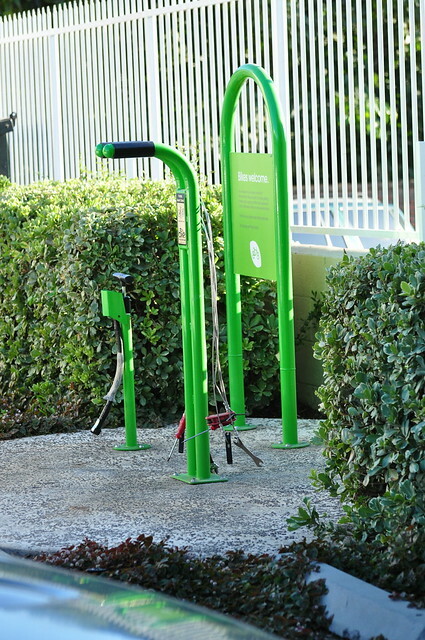 I’ve read tales of these bike stations popping up elsewhere…even the International Airport in Auckland, NZ (https://www.bikecommuters.com/2008/10/05/traveling-cyclist-amenities-new-zealand-style/). 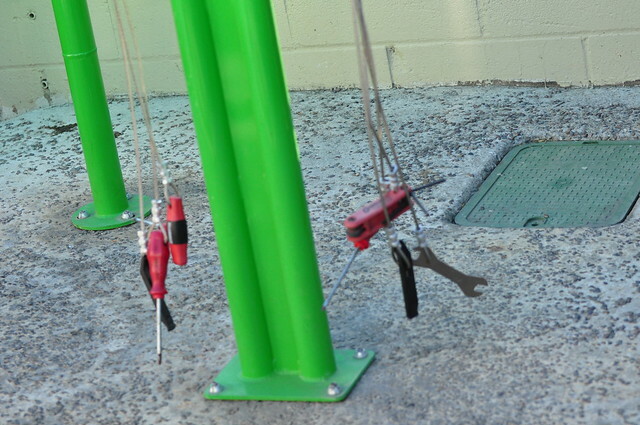 Heck, there are even bicycle-themed vending machines that sell tubes and repair parts out there! I have yet to see any of these in person, though, but I am looking forward to it. I hope many more places implement a good idea like this. 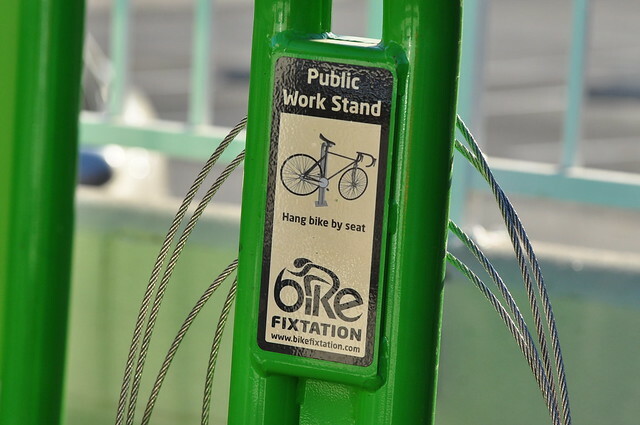 I wonder what the “tipping point” is for a gas station/convenience store to put in a bike station? Sounds like a good subject for an interview, eh, RL? Assuming it’s got an attached convenience store, it’s not odd at all. They make as much, if not more, on a bottle of gatorade as they do on a full tank of gas. As a result, it makes sense for them to do whatever will result in people coming into the convenience store portion. That is totally awesome, there have been many a time i have rident by a gas station and wished it had some tools for me because i was ill prepared for a problem that came up. I don’t think it’s odd at all. It’s pretty cool and clever. Not only do cyclists need to purchase items from the convenience store, but many also own cars. Where would you rather fill up? What a curiosity! I’d like to see it catch on too. I’ve used the air-machine-for-pay at the gas station before and gone in to get a drink…all the better if there’s tools & a stand around to help with other tune-ups. Gas stations don’t make money on gas. They make money on everything else they sell. This station is just trying to get you in the door. Not that there’s anything wrong with that. Wish there were more gas stations like this. Bike riders need some love too! 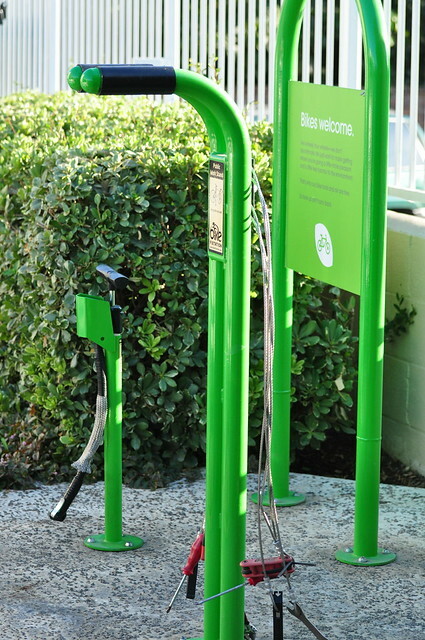 Love this idea for gas stations to have this. 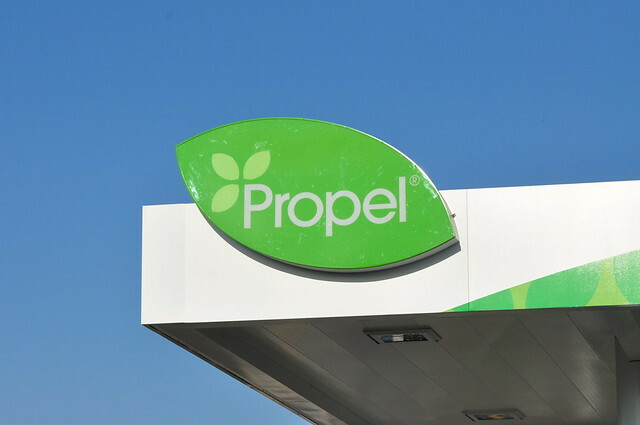 Well, Propel Fuels does serve only biodiesel customers. Maybe the idea is that someone driving a diesel converted car is on their way to a MTB trip and needs some air in the tires before they take off!! You know, green hippie clientel like both biodiesel AND bikes. Also, my brother (for some odd reason) commutes errands and the gym on weekends, and always goes to the gas station to put a little air in his tires… I bet he’d like something like this!